Environmental awareness is slowly growing in Panama. Government action to counter litter, especially of plastic, is increasing. Just a few days ago, there was another beach clean up in our town of Puerto Armuelles. As I was writing about Puerto’s beach clean up, I thought I should say something about trash in Panama. 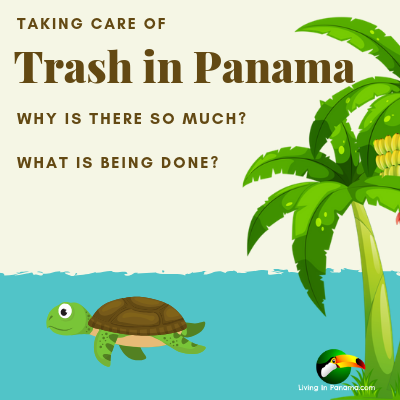 Panama’s litter and lack of garbage service is an obvious and unsightly issue. I intended to write a paragraph or so about it. I have always considered myself as someone who cares about the environment, certainly not a fanatic, but it is something I consider. I try to use reusable water bottles, cut up those plastic bands that hold 6-packs of soda together, bike instead of drive sometimes, and such actions. Basically, I am an environmentalist when it is convenient to be an environmentalist. However, my research for that paragraph has opened my eyes and radically strengthened my commitment to the environment. The short paragraph or so I had planned on writing has expanded to this longish article you are reading now. Puerto’s beach cleanup, while commendable, is simply an aside to the bigger issue of trash, particularly plastic trash, in Panama and around the world. Maybe the information in this article will open your eyes more fully as well. Now on to the topic: “About Trash in Panama”. It can be dismaying for North Americans & Europeans to see all the litter and piles of garbage in Panama and in Central America overall. One reason you see so much trash here is that the composition of trash has changed. The popularity of processed foods with its non-biodegradable packaging, styrofoam dishware, and the now ubiquitous plastic bags and bottles have changed the character of litter and garbage. In North America, this change happened many years before its impact was fully felt in Central America. Panama has not had the time nor education to change their traditional garbage disposal habits. Back in the day, dumping your trash in a pile, into the ocean or burning it did not have all the negative impacts it has today. Not that long ago, all or almost all the trash was bio-degradable. Now a big percentage of the garbage consists of plastic bags, styrofoam dishware, and other non-biodegradable packaging and items of all kinds. For instance, styrofoam dishware and building products like M2 have a lifespan of about 500 to 1,000 years. And such products are increasingly popular. Check out our article about building your house with M2. It includes a discussion of M2’s impact on the environment. Fish and animals are eating our discarded plastics and other toxic substances. The trash is no longer being composted to be part of the earth once more. This problem is huge. Not just for Panama, but for the planet and its animals. Later on in this article, I discuss ways that the Panamanian government is trying to solve this problem by endorsing zero waste and clean sea initiatives, banning plastic bags, and more. One of the reasons for the abundance of litter in Panama is the lack of garbage cans in public spaces. If there are no garbage cans and no community-consensus that littering is unacceptable, what happens to empty juice boxes and wrappers? They are dropped on the ground of course. And even when a city provides garbage cans they are often not emptied on a regular basis. Failure to empty over-flowing garbage cans indicates to the public that the government does not think that piles of garbage are an issue. It encourages an “if the city cannot be bothered to pick up the trash, why should I” mentality. Garbage pick up from homes is also an issue. Many people don’t want to or cannot pay the $4 – $6/month for garbage pick up. And in some areas, especially more rural areas, garbage service is not available. Lack of adequate garbage service and public health education results in many people in less dense neighborhoods burning their trash. Other people throw it in ravines, into rivers, or another out-of-the-way spot. A lot of that garbage makes its way into rivers and then on to beaches and then into the ocean. According to Panama’s Urban and Domiciliary Cleaning Authority (AAUD), the country produces more than 4000 tons of waste, out of which some 480 tons find its way into the Bay of Panama. And the Bay of Panama is only one part of Panama’s ocean. Efforts to combat litter and clean the environment are growing. And growing rapidly. Over the last 2 years alone, many more initiatives, pilot programs, and more are being pursued by both community groups and the government. In January 2018, Panama became the first Central American country to ban the use of plastic bags. This means that starting July 20, 2019, your groceries will no longer be bagged using plastic in Panama. Larger stores have 6 more months to comply, or until February 20, 2020, to stop using plastic bags. Starting on July 20th, shop owners are required to replace plastic bags with more environmentally friendly options like containers made of non-polluting materials or reusable plastic. They can sell their customers these reusable bags or containers at cost. There is an exception. Article 3 of this Law also establishes an exception: “it is not applicable when polyethylene bags must be used to contain processed or pre-prepared foods or wet items and it is not feasible the use of a substitute compatible with the minimization of the environmental impact”. The goal of the law is to reduce plastic consumption by 20% across Panama. Any fines imposed for non-compliance will be used to support recycling programs. About Plastic Bags. In the early 1960s, the “T-shirt” plastic bag which supermarkets use was invented by a Swedish engineer, Sten Gustaf Thulin. By the mid-1980s these single-use grocery bags were used extensively in Europe and in North America. In 1997, Charles Moore discovered the Great Pacific Garbage Patch in the Pacific Ocean. It is a huge floating island mostly made up of discarded plastic bags and other plastic items. Plastic bags come from the same source as all plastic: crude oil. It takes approximately 400 years for just 1 plastic bag to decompose. And that plastic bag, on average, is used to carry things for only 12 minutes. It is mind-boggling when you start to think about it. To find out more about the history of the plastic bag, click here. 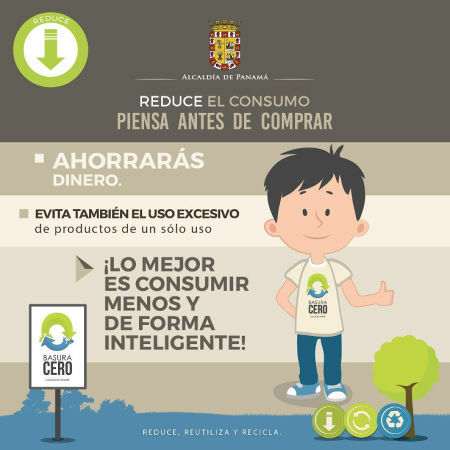 On May 30, 2018, Panama further committed to a clean environment by passing its Zero Waste (Cero Basura) Policy. What does zero waste mean? Every jurisdiction seems to have a slightly different take on it. In general, zero waste is a new approach and philosophy to how we think of garbage, of product design, of packaging and more. One way to describe it is that a zero waste policy seeks to maximize recycling, minimize waste, reduce consumption and ensure that products are designed and made to be reused, repaired or recycled back into nature or the marketplace. Less consumption, bio-degradable packaging, recycling and composting are 4 of the most obvious ways to get closer to zero waste. The County of Hawaii’s approach (below in italics) on zero waste may be a philosophy that Panama’s indigenous population would appreciate. I know the Kuna people of Panama have embraced a similar approach. “Zero Waste” is a way of life that promotes the goal of reducing the amount of material we throw away and instead reincorporating by-products of one system for use for another system. There is no such thing as “waste” in Nature. In nature, the by-product of one system is feedstock for another system. Only humans have created this thing like “waste.” Ancient Hawaiian culture lived this way before the term “Zero Waste” came to be. We can live this way again through small shifts in our daily activities. In this way, we greatly reduce our impact on Hawai’i Island’s natural environment, and how much rubbish we generate, protect Hawai’i Island’s natural environment, preserve our resources for future generations, and save our community tax dollars. Zero Waste is a global trend. More cities and countries are committing to zero waste as it is becoming increasingly clear that it is the only way to deal with the world’s looming garbage crisis. I am not sure what Panama, as a nation, intends to do in order to accomplish or at least get nearer to zero waste. I have seen flyers, like the one above, that the mayor of Panama City published. On the national level, I cannot find anything except some dense and jargon-filled statements about it. They are so vague as to be meaningless. However, Panama’s zero waste policy is still new and it is a very complex topic. Stating it as a goal is a good first step. Figuring out how to accomplish it will be Panama’s challenge in the years to come. Panama was the first in Latin America and the Caribbean to join the UN Environment’s CleanSeas campaign. The campaign’s focus is on fighting marine plastic pollution. The CleanSeas campaign aims to raise awareness of what plastic waste is doing to our oceans, our wildlife and ourselves. To help reduce plastic pollution, the campaign is targeting the production and consumption of non-recoverable and single-use plastic. Since it launched in February 2017, 60 countries have joined the campaign with many making specific commitments to protect oceans, encourage recycling and cut back on single-use plastics. Those countries cover more than 60 percent of the world’s coastlines. Panama, a country with almost 3,000 kilometers of coast in the Pacific Ocean and the Caribbean Sea, is pushing for comprehensive reforms that will improve its relationship with oceans. For instance, Panama is currently drawing up a national plan and legislation to combat marine litter. In fact, 2 deputies very recently introduced Bill 170 to eliminate styrofoam in Panama. The bill proposes to prohibit styrofoam from coastal areas and in public places in general. As of April 17, 2019, it is under consideration by the Commission of Population, Environment, and development. You may want to check this video (below) that I found on the Cleanseas website (cleanseas.org). It covers plastic’s history, impacts, and the complexities in finding a solution to plastic & plastic waste. All the efforts to raise environmental awareness in Panama seem to be working. At least, there has been a definite upswing of community groups participating in clean-up campaigns over the last 2 or 3 years. In years past, people would generally get together once a year to clean up the beaches after the rainy season. Now such cleanup efforts are much more frequent. This last weekend alone, April 6-7, there were a number of cleanups in Panama. The one I mentioned in Puerto Armuelles occurred on April 7th. You can find out more about Puerto’s beach cleanup here. Another successful cleanup event this last weekend happened at Panama’s Matias Hernadez river. The Marea Verde Association is conducting a pilot program called BOB, which stands for Barrera o Basura. (In English, Barrier or Garbage). BOB is basically a tied together line of large orange floating buoys (see photo). BOB reminds me of the barriers used to make swimming lanes in a pool, but much bigger. BOB’s buoys are stout enough to capture all the garbage floating downstream. Generally, they install BOB across a river before a big storm in order to stop any garbage flowing down the river. Then they collect that garbage so it does not end up on beaches and in the ocean. Most recently, they installed BOB on the Matias Hernadez river in anticipation of last Saturday’s storm. 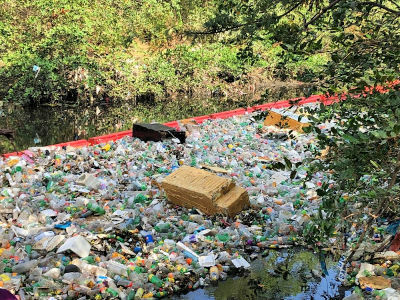 This “dam” captured an enormous number of plastic bottles and other garbage. The Marea Verde Association did a fabulous job cleaning up the river. Without their efforts, all that garbage would now be in the Bay of Panama (Bahia de Panama). In another part of Panama, the students from the International Academy of Boquete spent this last weekend cleaning up the well-known Quetzales trail in the National Forest reserve. In addition, the Marabuntas Chiriqui group organized a community clean up of the river in Dolega on April 7th. Without a doubt, more and more people are organizing to clean up Panama’s outdoor spaces. A commendable community service. There is also a greater awareness of the negative attributes of littering, a greater desire not to see trash littered on the ground. Even looking around our small town of Puerto Armuelles you will see many more “Prohibido Tirar Basura” (no littering) signs than you saw in years past. As you have read, nationally, there has been a much greater commitment to a garbage-free landscape. And there are signs of it in various cities as well. For instance, I have seen public recycling bins in David’s Parque Central (central park). As the public’s environmental awareness increases, there must be some infrastructure changes as well. Small, but critical items that will encourage and positively reinforce the growing desire to keep the planet clean. One of the best ways to change cultural attitudes about trash is in schools. Panama already has various anti-littering programs in schools. Hopefully, expanding these programs and methods will not only help eliminate litter but also improve our environment worldwide. Education is not enough. Garbage cans and garbage service are 2 critical items that need to be provided. But for the most part, public garbage cans are few and far between in Panama. There won’t be an appreciable change in littering until many more public trash cans are provided. And those cans must be regularly emptied before they start to overflow. Plus, local garbage service should be expanded. Paying for regular garbage service should be encouraged, if not required. For those that cannot afford it, subsidized or free garbage service should be considered. Given a choice, most people want the city to haul away their trash. It is much easier than having to haul it to the nearest ravine or another unofficial garbage dump. And it is in the best interest of everyone to provide garbage disposal. Garbage dumped in ravines and elsewhere is almost guaranteed to end up on our beaches and into the ocean. Of course, there are a number of issues not addressed here. For instance, what to do with the garbage once it is collected? Improperly managed landfills are a hazardous issue in Panama. Google “landfill fires in Panama” to find out more. And what about recycling? Recycling sounds like an easy solution, but it is actually quite complex and is often too costly to accomplish. Now that China is no longer accepting the world’s plastic and various other waste, it has become even more complex and costly. It seems clear, “What we need is a revolution“, as the UN Environmental director said. A revolution in the way we consume. A new philosophy that is closer to the “Leave No Trace” motto that backpackers & campers embrace. In my opinion, a world-wide zero waste goal is impossible to achieve. However, perhaps we should try to get as close as we can. For that reason, I was really pleased to learn that Panama has eagerly signed on to a number of worldwide and local initiatives to lessen’s Panama’s negative environmental impact. We are still in the early days of the fight for the planet’s health. I am happy that Panama is one of its warriors.